This statistic has been taken from the GfK report 'How People Use Primetime TV 2015'. 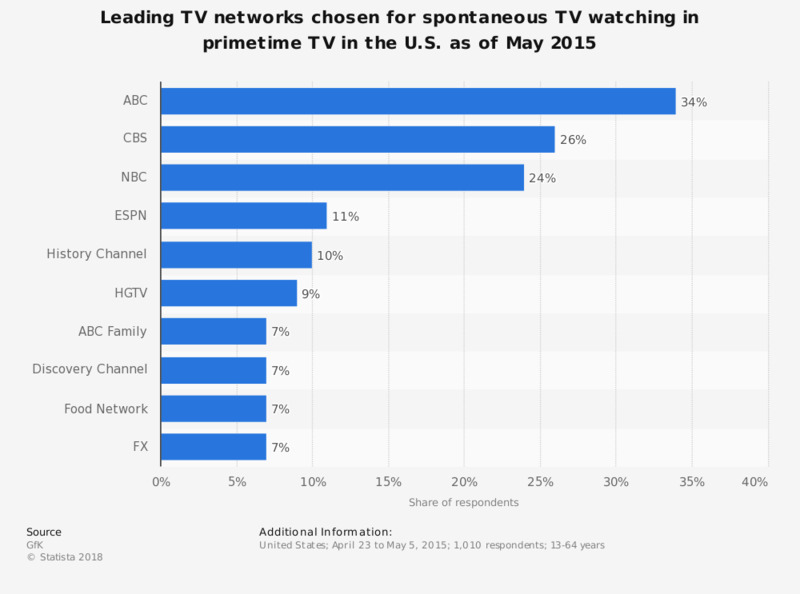 The graph shows the leading TV networks chosen for spontaneous TV watching in primetime TV in the United States as of May 2015. During a GfK survey, 34 percent of respondents stated they would turn to ABC first, if they were not planning to watch any specific programs. Further 26 percent named CBS in their top three channels to watch spontaneously. The 'How People Use Primetime TV 2015' report from The Home Technology Monitor™—GfK’s respected media technology research service – documents the audience’s use of television during primetime. It shows changes in primetime TV usage since 2004. The study looks at how people perceive their typical television behavior by detailing their primetime TV use yesterday. The report also explores attitudes towards primetime advertising. This question was phrased by the source as follows: "If you were to sit down to watch regular television (not streaming), and you weren't planning to watch a specific program, which three networks would you turn to?"